Life Cycle Analysis (sometimes known as ‘cradle-to-grave’ or better still ‘cradle to cradle’) is the analysis of a building’s total demands on the environment throughout its whole lifetime, usually measured in terms of energy used but also in terms of how building materials can be reused, or whether, for instance they lock in carbon, as with timber construction. Greenspec have a good section covering materials. and you can see how each element fares by each factor by clicking on it. However there has been considerable criticism of the guide because it doesn’t explain how its methodology works and it does not distinguish properly between embodied energy and in-use energy. The A to E ratings are simply relative ones with no actual values involved. The whole thing is a bit of a mishmash. Recycled materials are those that are chopped up, melted down, ground down etc. and then made into something else (or maybe a similar thing). 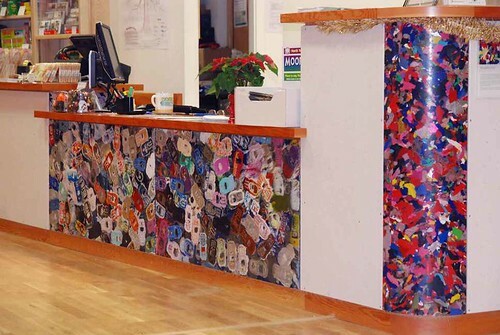 Smile Plastics do a beautiful range of plastic sheets made from all kinds of plastic waste. However there is a bit of an issue here with what might be called ‘recondoning’. As with the recycling of uPVC in the window and door manufacturing industry the question arises as to whether oil based plastic should have been used in the first place, considering the risk of pollution from oil mining. Sure, it is better to recycle than to use new material but it would be better still not to have used that material at all. Reused materials are those like floorboards which are taken up and then relaid somewhere else. There’s a growing number of outlets and on-line exchange facilities for reused materials but this is a kind of tricky issue because the way you design a house may depend on what is available at the time. No good designing a roof to use salvaged tiles or slates if they are not available when you need them. Helps if you can revert to a new equivalent if you get caught short, especially if the planners are keen on exactly what gets used. However there can be a good deal of satisfaction in reusing materials; big environmental benefits, connection with the past, and sometimes a more relaxed feeling about not needing to get things perfect. 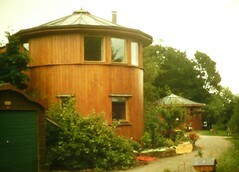 Houses made from old whisky vats at the Findhorn FoundationThe Findhorn Foundation is a large community near Inverness. There is a strong emphasis on sustainable building. A particularly good book on the ecological aspects of building materials is ‘The Whole House Book’ (although it is now getting a bit dated on things like the building regulationsThese are the mass of regulations that cover safety, health, welfare, convenience, energy efficiency etc. in the way buildings are constructed. Not to be confused with Planning consent (which is more to do with whether you can put up the building in the first place). See more on the regulations ).